Our seventh year, and a glorious return to Santa Cruz, site of the best-attended MUni Weekend ever! 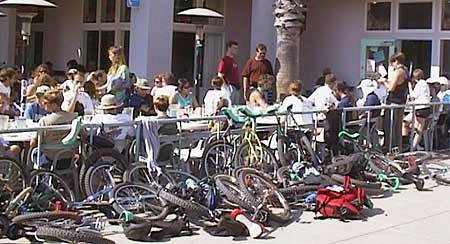 The 2002 California Mountain Unicycle Weekend, hosted by Bruce Bundy and Nathan Hoover. Register Now! Please register in advance. It will save you, and us, lots of time on ride day. Plus it will help us prepare the T-shirts, lunch, and other details. Click on the link to the Registration Form. Please note that you can fill out this form online, before you print it! Don't forget to sign your life away after printing. Mail to the address at the bottom. Detailed directions, to go with the schedule information below. Looks like we will have a professional video made too—you'll be able to pre-buy it for a discount when you register. You can also order videos without coming to MUni Weekend. John Hooten and John Foss came up with a design. It will use the logo image from the 2000 MUni Weekend (the Sobe Lizard Fuel-inspired MUni guy). Shirts will be Nathan yellow, with the designs in dirt brown and forest green. The slogan message for this year is: "2002 one wheeled Cruz." Shirts will be available in S, M, L, XL, and sweatshirts, size L only. First come, first served. You can order shirts or videos without coming to MUni weekend! Bruce recommends the Inn Cal. They are giving everyone in our group a 10% discount (they are already the cheapest place in town and just a couple blocks from his house, so it should be a pretty decent deal). 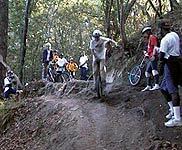 Just make sure to mention "California Mountain Unicycle Weekend" when making your reservation. Let me know what rate they quote you, so I can publicize it to the rest of the people staying there. Thanks!